And anything else you need to party! 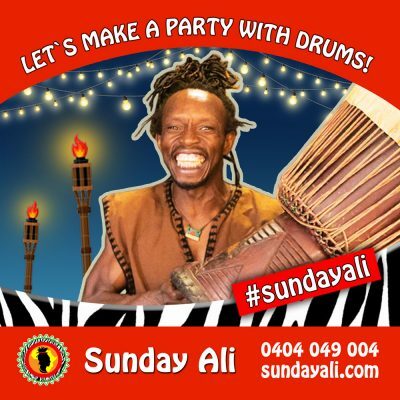 Sunday Ali is an AFRICAN DRUM AND DANCE performer and he has developed a very great show which gives you by live performance a journey into African culture by music and dance and personal adventure stories. His team of African performers have been entertaining for over 20 years to all audience numbers and loves to create amazing memories for every age together at the same time. Sunday Ali delivers a combination of drumming and dancing. He loves to make your occasion super great. You can call him direct to discuss your personal needs, your ideas and together, we can make what you want, when you want it. Ignite your next company dinner or event with an unforgettable live African drumming and dance performance! The vibrant rhythms and energetic dance moves will really get the party started and create a fun, lively atmosphere! Guests are always a part of the action. With our interactive, you will be screaming for more Sunday time! Sunday Ali’s show makes your event experience amazing. Book him NOW before his dates runs out! Our show package is for up to 50 people including all show drums and musical instruments to make our show great. On ordering, you can add additional guests numbers beyond 50. Once all is confirmed, you will recieve a booking confirmation by email. For any questions, please send us a message on our contact page.